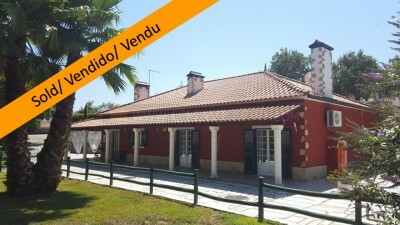 A three bedroom house with a large garage and well estabilished garden for sale near Tomar, central Portugal. The house, which is set over the one level, is connected to both mains water and electricity and benefits from having a borehole for irrigation purposes. The house is in a good decorative order and is double glazed throughout with mosquito nets in two bedrooms. The house has air conditioning installed in some divisions and measures 317 square metres of construction. The house comes with 4,840 square metres of land. The house is situated close to the village of Carril, which has a small mini-market and cafe bar, and is in a private situation. There is a gated driveway which leads down to the side of the house where there is a large marble paved patio area. The main entrance to the house, which has a covered terrace to two sides, leads directly into the kitchen. The kitchen is spacious and double aspect. The kitchen has laminate flooring and partially tiled walls. There is a good selection of built in base and eye level Oak units with lovely worktops. There is also a large fire place place which has had a wood burning stove installed. Off the kitchen there is a hallway, which has a tiled floor, providing access to the living room and two of the property’s bedrooms. The living room is also spacious and has a tiled floor. The living room has two sets of patio doors which lead out to the covered terrace at the side of the house. Here there is also a salamander stove as well as air conditioning. Both the bedrooms accessed off the hallway have tiled floors. One of these bedrooms has air conditioning installed. There is a family bathroom adjacent to these bedrooms, which is fully tiled. The bathroom has a corner bath with shower attachment above, contemporary style glass vanity basin and toilet. The third bedroom is accessed off the living room side of the kitchen and has it’s own en-suite bathroom. This master bedroom has a set of patio doors which leads out to the covered terrace at the front of the house. The en-suite bathroom is fully tiled and has a hydro-massage shower, toilet, bidet and vanity basin. At the rear of the house there is a single storey entertainment room. This entertainment room has a tiled floor, corner open fireplace and built in barbecue and food preparation area. Off the entertainment room there is a fully tiled toilet. Adjacent to the entertainment room there is a large storage room, which is being utilised by the current owner as a spacious log store. Opposite the house there is a large garage, which measures 60 square metres of construction. There are two metal vehicle access doors to the front. The garage is spacious and can accommodate a number of vehicles as well as a work shop area if required. This building has been split into two and would be large enough to convert one half into living accommodation and leaving the other as a spacious work shop. The property is set on a plot measuring 4,840 square metres, the majority of which is relatively flat. There is a good variety of mature trees in situ including Olive, Apple, Peach, Oaks and Palms. The property has an automatic watering system installed and the land is completely walled and fenced. There are various shaded areas which have been converted into lovely seating areas. The property has automatic vehicle entrance gates to the front and while it is secluded it is not isolated being only a short drive into the centre of the village of Carril, which has several cafes and a small mini-market, all of which are within walking distance from the house. The property is easy to access and has good links to the IC3 dual carriageway. The larger, historic town of Tomar, which is home to the Convento do Cristo, is only ten minutes by car. Tomar is a bustling market town, which has a good variety of supermarkets, cafes, restaurants, banks, shops, pharmacies, health centres, sports centres, library, university, hospital, bus and train station, historic monuments and parks. Castelo do Bode lake, Portugal’s second largest reservoir, is only ten minutes drive in the opposite direction. Castelo do Bode lake is popular for all kinds of water sport activities including swimming, sailing, canoeing, scuba diving and water skiing. The lake is also a haven for wild life and there are many river beaches close to the property where you can relax and enjoy the scenery. The closest airport to the property is located at Lisbon, which is around one and a quarter hours’ by car. Lisbon airport is serviced by a variety of low cost airlines which operate regular flights into and out of the United Kingdom and other European countries.